We have added a new feature to our Altadena filming map. Users who click on a map marker may now see a 10-year history of filming activity for the location at that marker. Click on the marker for that location (orange or reddish color.) A legend will appear on the left with summary information about that location. A link now appears at the bottom of the legend under the title "all filming." Click on the "all filming" link. A new tab will open with a table showing the 10-year filming history for that location. Please note: The listing capability only applies to locations with street addresses like private residences, parks and businesses. Locations are designated by orange or reddish colored markers. Currently the map does not provide the detailed listing of activity on streets and grid. Streets and grids are designated by blueish markers. Please send along any comments, questions or suggestion for improving the map. AltadenaFilming has posted a new map that charts a 10-year history of filming frequency in Altadena and the unincorporated neighborhoods in adjacent zip codes. The data for the map was derived from filming permits issued by LA County's filming permit service, FilmL.A. The map illustrates two types of filming activity: filming at individual locations and filming on area streets and grids. Scaled location markers are used to show varying levels of filming activity. For more information about the map see Altadena Filming Frequency Map in the "AF Resources" menu. Coming this Fall: The Altadena Filming Frequency Map will be upgraded. Each location will include a clickable link that displays the history of permitted productions that occurred at each location. For an account of how the data was acquired see https://www.altadenafilming.org/2018/06/the-data-chase-learning-ropes.html. It wasn't so long ago, we heard a LA County official assert that Altadena was an attractive filming location because of the permits fees were the lowest in the region. While this might not represent a majority view among our officials, it seemed a topic worth a bit of noodling. 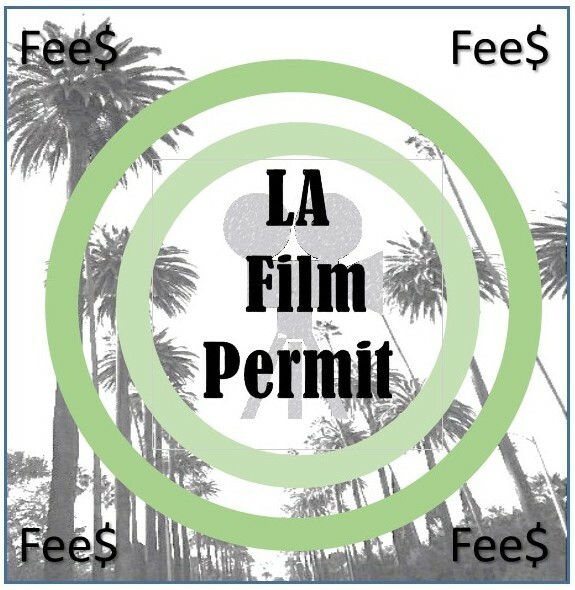 Highest permit fee: Pasadena has the most expensive filming permits. Altadena is a close second. Permit fees for either Pasadena and Altadena are more than twice as much as any of the other communities surveyed. Surprisingly, the cost of a filming permit in Altadena may not only among the most expensive in the region, it may be among the most expensive in the nation. It's safe to say permits in Altadena are no bargain. Is this a problem? Do high permit fees hinder job growth? Is there any relation between filming permit cost and filming activity? We then compared filming activity in 2010 to filming activity in 2016 using 'shoot day' data from FilmLA's quarterly reports. It appears that filming activity increased 30%; during those 7 years. In other words, filming jobs seem to be growing apace in the LA despite the high permit fees. No surprise. The cost crew travel fees would quickly offset any savings that might be earned by traveling out of the area to get a cheaper filming permit. In other words, the high cost of a filming permit in LA does not seem any more impact on jobs in the film business than than the growing pile of junk in our garage has on the rotation of the earth. We can rest easy on both scores. Note: According to the County CEO, 'review fees' pay for the staff time need to review a filming permit application and 'service fees' recover the personnel cost need to support filming. 2 Student filming permits were excluded. While student filming may be key to developing a work force for the film industry, it does not figure to be a significant source of those well-paid film industry jobs. If you should happen to be a regular reader here, you may recall that the County Supervisors asked the County's Film Liaison to make some recommendations. That was a bit of a puzzle. Who knew the County had a Film Liaison? What did this Film Liaison do? The office wasn't listed. Googling was useless. But, with help from our local County Field Deputy, the Supervisor Barger's Planning and Public Works Deputy, and a few other hard working County officials, we were able to reach Gary Smith, LA County's newly appointed1 Film Liaison. 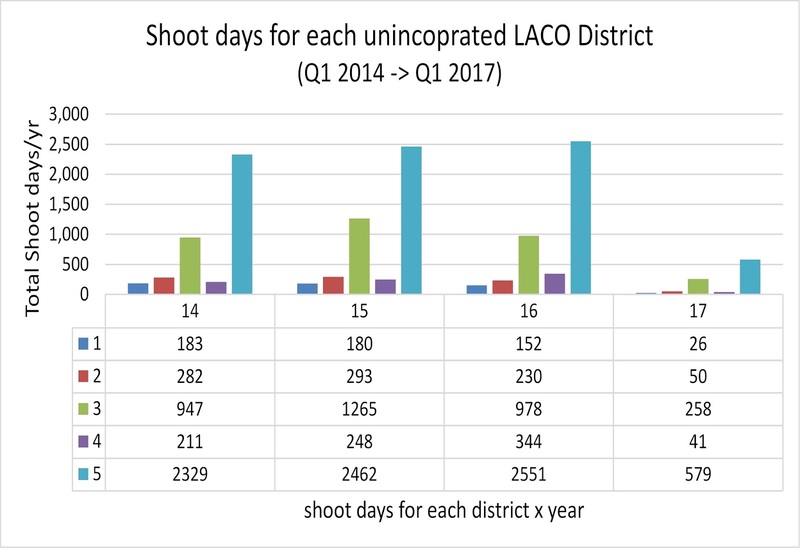 We used this quarterly-report data to put together a few charts that show filming activity for the unincorporated areas of the County. If you should happen to be a person who prefers data as a basis for fact, perhaps the following will be of interest. Q: How much filming occurs in the unincorporated communities compared to other areas of LA County? On average 12% of the filming permitted by Film LA occurs in the unincorporated areas of the County. The estimate does not include filming in places like Burbank, Glendale and Pasadena which do not use the FilmLA permitting service. 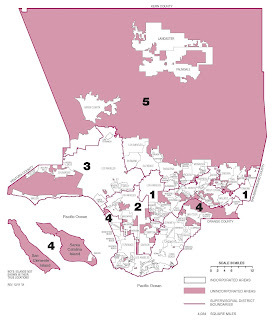 Q: How much filming occurs in LA County District 5 (Altadena's District)? 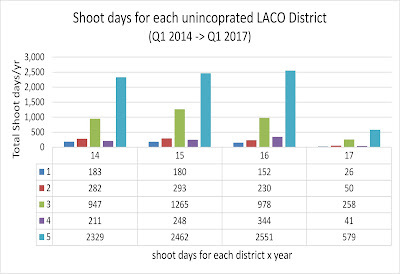 On average, 60% of all shoot days in the unincorporated areas occurs in District 5. Approximately 2 million people live in the unincorporated communities in LA County. Approximately 400,000 people live in the 70 or so unincorporated communities of District 5. Altadena is the largest unincorporated community in the District with approximately 44,000 residents. The Film Liaison's report does not include enough information to determine what percentage of the District's filming occurs in Altadena zip codes. However, using AltadenaFilming's film permit map data, we can estimate that 29% of District 5 filming occurs in Altadena. Q: How many filming complaints were recorded from each of the unincorporated communities. 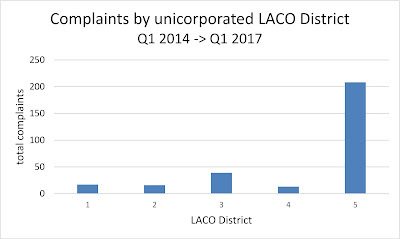 Between 2014 and 2107, FilmLA recorded 293 complaints from the unincorporated areas of LA County. 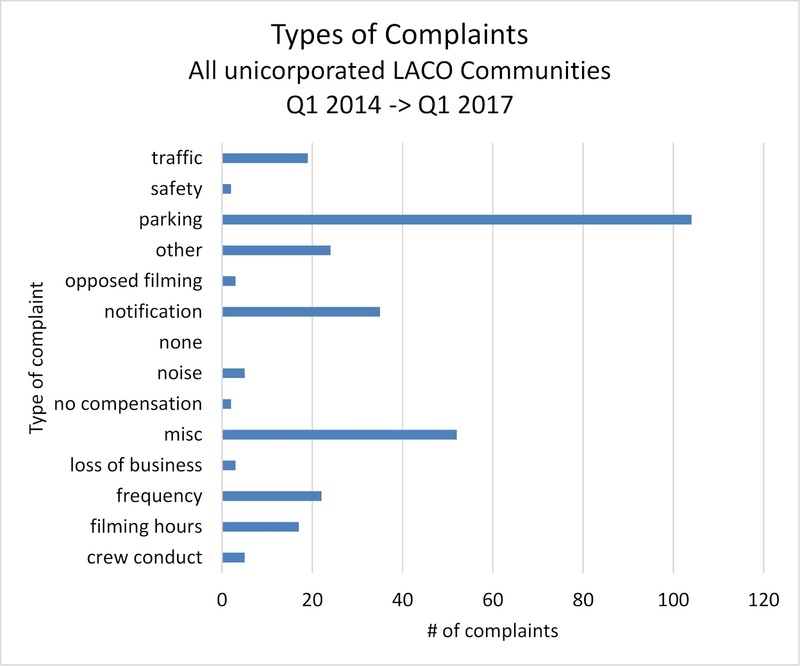 Nearly 71% of the complaints concerned filming activities in District 5. Note: Last year NBC4 reported that, in 2015, there were over 2,900 filming complaints just in the City of Los Angeles — a rate much high than that reported in the unincorporated areas. 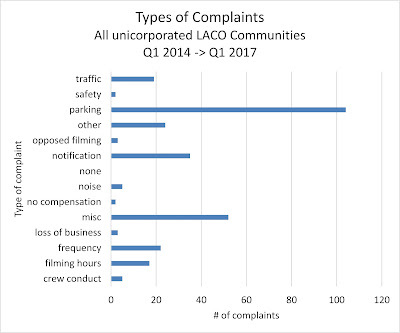 The disparity suggests that either complaints are under reported in the unincoporated areas or that film companies are, in general, better behaved when they leave the city limits. Q: What is the most frequent complaint about filming? Q: What about the rate of complaints? Are they higher in District 5? 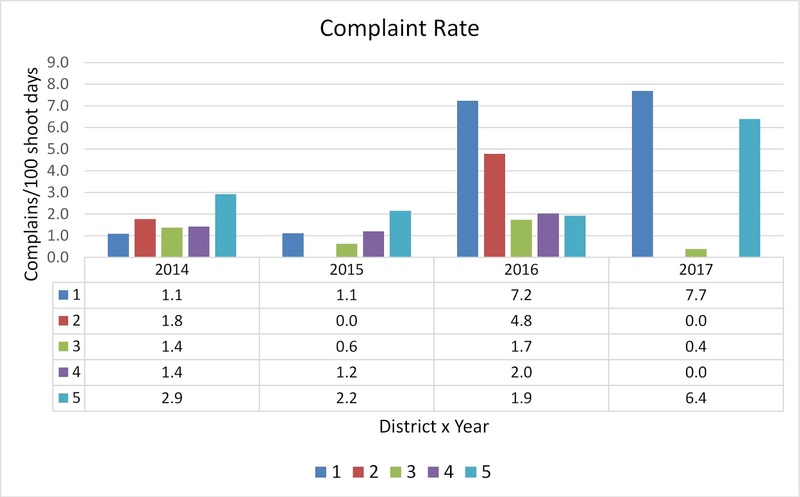 With the exception of 2016, the rate, as complaints per 100 shoot days, for District 5 is in line with other districts. 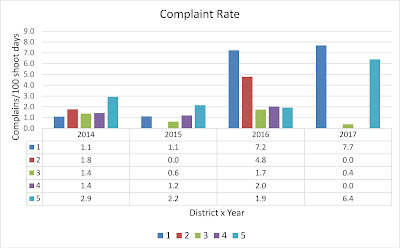 However, it appears the complaint rates for District 1 and 2 shot up in 2016. Overall, filming in the unincorporated areas plays only a minor part in LA County's overall film-production picture. However, a large majority of the filming in the unincorporated communities takes place in District 5. Since the Film Liaison only provided data for the unincorporated communities, we'll conjecture that LA County's jurisdiction for film permitting approval and enforcement is limited to just these unincorporated areas. If true, District 5 is the District most affected by the County's filming permit approval and enforcement policies. In that case, Supervisor Barger should rightly have considerable sway in any Board decisions concerning film permitting and permit enforcement. The report only includes data for the unincorporated communities of LA County. The data does not include results from incorporated communities like Monrovia, Pasadena, Burbank, etc. 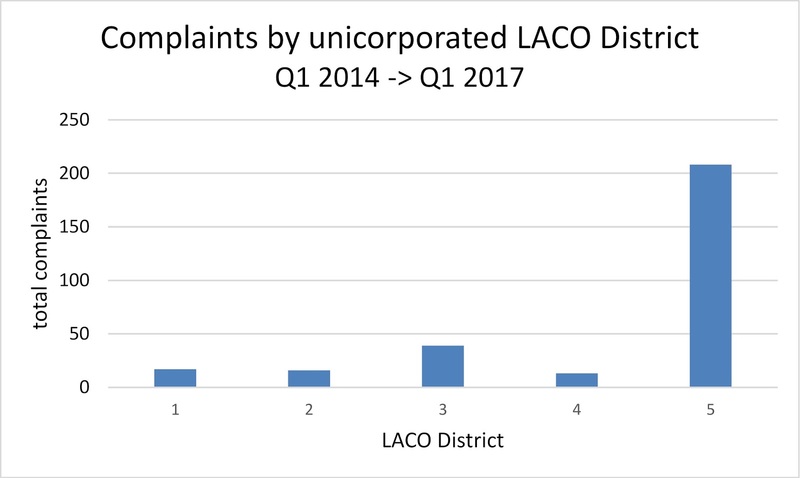 The Film Liaison's report included a summary of frequency and complaint data for each quarter in each district from Q1 2014 through Q1 2017. The report also includes a County-wide summary of frequency and complaint data. The contents of the report were extracted to text and modified for export to excel. Starting in 2015, FilmLA began reporting frequency as Shoot Days. Prior to 2015, FilmLA reported frequency as as both Permitted Production Days and Shoot Days. Here's FilmLA's definition of the difference. A Permitted Production Day (PPD) is defined as one crew’s permission to film at a single defined location during all or part of any given 24‐hour period. This measure is best used to quantify days of impact from filming on area communities. Determining PPD involves looking at all calendar days in which filming occurs, and summing the number of unique locations filmmakers were permitted to use on each day. Shoot Day (SD) is defined as one crew’s permission to film at one or more defined locations during all or part of any given 24‐hour period. This measure is used to quantify how many days of work film crews perform during a given time period. Determining SD involves looking at all calendar days during which filming occurs, and summing the number of unique permits simultaneously active for filming on each day. In order to normalize 2014 frequency data with the 2015 and 2106 data, we used FilmLA's 2010-2014 data to calculate a Production Day to Shoot Day ratio. The ratio is roughly two-thirds. We used that ratio to estimate 2014 Shoot Days. It appears that this techniques underestimates the actual values. The quarterly report data has errors. The County-wide summary is inconsistent with the data from the individual districts. In our reports we used the data for individual districts and ignored the County-wide data since it is likely that the inconsistency is the result of arithmetic errors. FilmLA issues quarterly press releases on shoot-day data for all the incorporated and unincorporated areas they serve. These FilmLA press releases were used as a source of data for the county-wide comparisons. 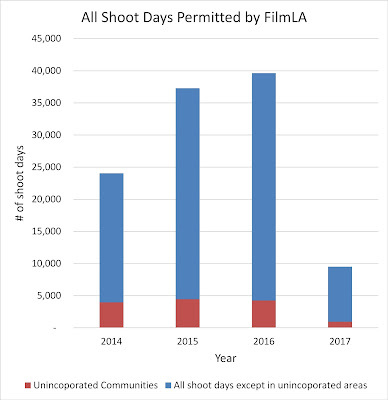 An estimate of annual shoot days in Altadena was based on data that was accidentally released by FilmLA — the same data is used to generate the Altadena permit map that appears on this site. The Altadena estimate is based on the following: between 2012 and 2015, there was a yearly average of 478 filming permits issued in Altadena. If we assume a day-and-a half of shooting for each permit, that's an average of about 717 shoot days per year. Based on the Film Liaison's report, there are roughly 2,500 shoot days each year in District 5. If these estimates are accurate, then roughly 29% of District 5 filming occurs in Altadena. 1 : The County's Film Liaison was recently moved to a new organizational home. Previously, the office was located in the CEO's Office of Unincorporated Area Services. It is now located in the CEO's Economic Development Affordable Housing Division. 2 : The LA County CEO recently publish a memo describing the Film Liaison's responsibilites. Self-sufficient regulation: Who's the real customer? When I moved in LA as a hungry freelancer, a gallon of gas was 65-cents and a stamp was 15 cents. If you worked with a crew of less than 20, it didn't really matter much if you had a filming permit. The risk was low; unless you got unlucky and caught the attention of a curious cop. It was the wild west. No one interferred. Bigger shoots were different; you were sure to get attention. You needed a union crew, a cop and a permit. So you called Acme Permits Inc for the permit and the cop. For a couple hundred bucks, Acme arranged all the particulars. Even dropped your permit off at the production office. Life was good. In those days, filming on-location was just becoming the norm. Film crews in the neighborhood were still a novelty. Neighbors were curious and friendly. You could shoot at all hours. There were plenty of twenties to hand around. And, when it came to lawnmowers or chainsaws, the union men or the cops would be all business. How times have changed. At least in LA. Regulation without cost? For a nominal amount, the industry was going to pay for it's own regulation. It wouldn't cost the taxpayer a nickel. What could be better? But, take a close look and you might see a couple flies in the ointment. For one thing, the price of FilmLA's basic permit application is about the most expensive around. Check out the table below. Aside from Sierra Madre and Pasadena, an application for a filming permit in Altadena is the most expensive in the area. More expensive than San Marino, New York City, or San Francisco. It's nearly twice the cost of pro-film communities like Santa Clarita and Burbank. And Riverside is free! (Think mattress sale.) These prices make for a sharp contrast with pro-film Louisiana and Georgia. I know that if I was still in the film biz, I'd just assume skip the hassle and expense. Note: these figures do not include all the extras that can easily double or more the cost of a permit. If you should happen to also be thinking that the relatively high cost of a filming permit might be a disincentive to companies who might be interested in filming in Altadena, then consider this: the California Film and Television Tax Credit Program 2.0 gives film companies an added 5% bonus in tax credits if they take their business out of the "LA zone." If you just consider fees and taxes, Altadena may not be such a great place to shoot. I digress. Why then is a FilmLA permit comparatively expensive? My hunch is that other governments with cheaper fees subsidize the cost of permit coordination. In other words, the business of issuing film permits is at least partly paid for by the taxpayers. Is that a bad thing? Isn't "self-supporting" inherently good? The question suggests there's something else in the ointment of a self-supporting regulation. Consider this: FilmLA has $10M in annual expenses, nearly 100 employees and a $300K per year CEO. That's a LOT of permits at $635 a pop. Let's try a conservative estimate. 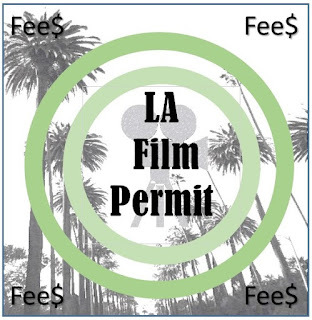 Let's say that FilmLA is able double the permit tab (by including charges for a Monitor and a few extras) so that the average permit fee for a film shoot comes to around $1,200. To make that mark, FilmLA must print around 8,300 permits per year or about a 150 per week. Mind you FilmLA provides permits for LA County, LA City, Monrovia and a few spots in Orange county so the volume might be there. But no matter, that's a lot of permits to crank through just to make their nut. Here's the rub: If you think of a customer as someone who pays you money for a service, then FilmLA's customers are the film companies. Not the County. Not the neighborhoods. The film companies. Sure there's a stipulation in the County Ordiance to "avoid or mitigate adverse effects or incompatibility between such short such short-term land uses activities and the surrounding area where these temporary activities are proposed," but without 30 film companies knocking on FilmLA's door every day, FilmLA goes bust. All of that leads me to think that if FilmLA seems more protective of the film industry than our neighbors, it makes perfect sense. After all, who's the real customer? * In 2005, the name was changed its name to FilmLA shortly after its President was found guilty of misdemeanor forgery.